« Employees and Company Credit Cards – What’s the Charge? A QuickBooks Tip on how to add your company logo and customize yoour Estimate, Invoice, and Purchase Order forms in QuickBooks. So you use QuickBooks for your all of you bookkeeping and accounting functions, including creating Estimates, Invoices, Purchase Orders, etc. Good for you! It sounds like you are using many of the built-in features and functions. But do the “forms” you send your clients/customers, vendors/subcontractors scream QuickBooks when they are opened? Just because you use QuickBooks doesn’t mean that you can’t send out professional looking forms. Spend some time working with your Form Templates and go from drab to WOW! Where do I find the Form Templates? You’ll find the Form Templates from the QuickBooks List menu -> Templates. Once there if you look in the Type column you’ll see that there are many pre-configured Invoice, Credit Memo, Sales Receipt, Purchase Order, Statement, Estimate and Sales Order Templates. How to customize a form. The first piece of customizing form, is deciding which type of form you want to work with. So for example, let’s say you wanted to create a more professional looking Estimate form to send to your customers. Use the graphic below to follow 7 steps for customizing a form. Check the Use Logo option and then click the Select Logo button when it becomes active. Browse to and select your logo file. Here’s your QuickBooks Estimate template, which has gone from drab and boring to a much more professional looking design that just says WOW! 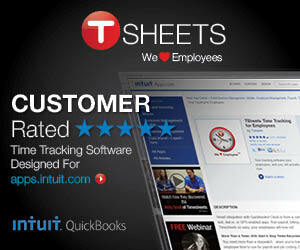 We hope you found this QuickBooks How-To Tip to be useful. If so please take a moment to leave a comment or to share it on your favorite social media site using the buttons below.